Sometimes I wish I could sweep up every book in bookshop into a magic carpet. Then somehow I could read them all in an instant. Alas, this will never be the case. So instead, for avid readers like myself, we always have the difficult decision of choosing which book to read. For every book which you spend weeks reading, there are innumerable other books, which you could have chosen. I find my books in numerous different ways. I use Twitter often, and I’ve got recommendations from folks I follow, including my current book, Five Germanys, which is, as you might have guessed about five different periods of German history. Other times, I might find books by browsing through a display in a bookshop. 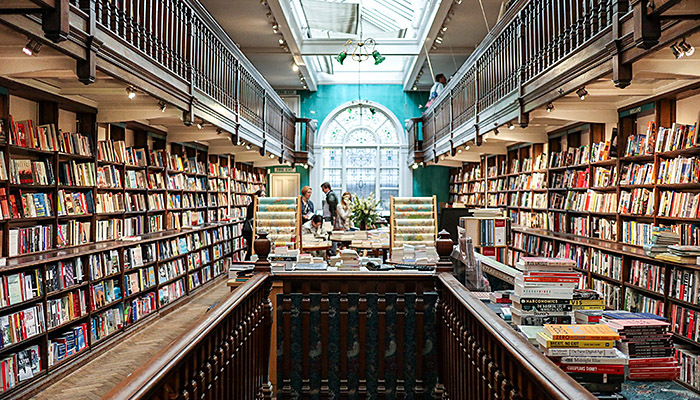 My favourite bookshop is Daunt Books in Marylebone, pictured above, which is in the premises of an original Edwardian bookshop. I could wonder there for hours, flicking through books. Somewhat unusually, the books are arranged by their country of origin, as well as in more general fiction or non-fiction sections. Very often I’ll randomly find books there, that I’m pretty sure I would not have read otherwise, because of this unusual display arrangement. Another bookshop I like is John Sandoe, just off Kings Road. There’s a large table in the centre of the bookshop, which is filled with new books, in (what appears to be) random piles. I can guarantee that you’ll find at least one or two quirky books from this table. The staff are also very friendly, and often recommend to me books to read. Of course, Amazon has a much larger selection of books than any “real bookshop” and is particularly good if you already know the book to buy. However, if you want Amazon to recommend books, very often their algorithm will suggest books to sell to you, similar to those you have already bought. It is true that many books I read tend to be similar. Yet, to really have a broader view of the world, ideally, I want to read at least a few unusual titles. Reading similar books is never going to give a broad views of ideas. That’s why I love independent bookshops, the element of surprise, which you never quite get when you go browse through Amazon. You could replicate it maybe, by randomly clicking on links on a website, but let’s face it, it’s a bit nicer to walk through a bookshop randomly to accomplish this. I love to visit bookshops when I’m travelling because it gives me another opportunity to find that illusive random book! There’s a real contrast between the books stocked in London bookshops versus those for example in New York, whether its chain stores like Barnes & Noble or booksellers like Shakespeare & Company and Strand. It’s very easy to stay in your comfort zone (I hate that expression, but am struggling to find any better way to express it) and read the same types of books all time. We can draw a parallel with markets. In markets, it’s also very easy to fall into the same habit of sticking to the same old strategies and pretty much just spend on all your time tweaking them. This should not be confused with having market discipline, which is important. It is more a case of saying, that a strategy seems to have worked well, and then not attempting to try anything which is different. I remember when I started in markets. I thought that probably the “secret” was to come up with an amazing strategy and then my job was done. Wrong! In practice, the secret, if there is one, is to keep on researching new trading strategies. Of course you hope that these new strategies are very different and uncorrelated to your existing ones. Sometimes it might be some random message you’ve seen on Twitter or sentence you’ve heard a trader say, which will inspire a trading strategy (just like finding that book randomly). Some new trading strategies you’ll like, you might find you’d never want to trade. Others, will be worth spending more time to develop. With the increase in the alternative datasets there are also many more things to investigate as inputs into trading strategies! Of course there are always different definitions of what is “good” for you, depending on who you are. Strategies with very high Sharpe ratios might look great on paper, but their capacity is limited. By contrast, if you have less capital to deploy, these types of strategies will be fine. So maybe, next time you want to read a book, maybe stroll through a bookshop, and find something you’d never have picked up otherwise. Sometimes we might be fooled by randomness, but randomness can be just the right way to find new ideas sometimes.